The Christchurch Cafe is a nonexistent cafe that sells nonexistent coffee. If they weren't putting every cent they made into charity, I'd call that a pretty solid business plan. 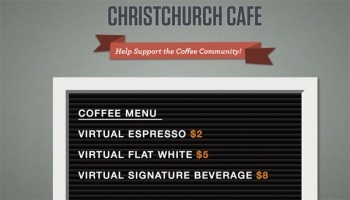 At the Christchurch Cafe site, down below a menu selling coffee-themed items from a $2 cup of virtual espresso to a $300 virtual espresso machine, sits a disclaimer, "You will not receive any of these things when you pay." The site was created to benefit the coffee purveying community affected by the earthquake that destroyed homes and killed over 150 people in the Christchurch area of New Zealand in late February. So what exactly do you get for your $2? "What you will receive is a warm feeling inside that you have helped coffee professionals in the Christchurch area." According to the site, every cent brought in by the fake coffee purchases will go to someone affected by the disaster. All hosting and fees associated with keeping the site up is donated, so rest assured knowing that all proceeds of your fictional frappuccino will go to the people who actually need it. This is, in my humble opinion, a genius idea. Not only is it a fun theme for the charity and a snazzy way to lay out a website, but the comparison of the price of helping someone to the price of a cup of coffee is sure to make people feel guilty enough to donate. It says, "Well, you could help someone in need, but yeah, you need your coffee. No, go ahead. You've got 5 bucks for an overpriced cup of Starbucks, but nothing for those less fortunate. We understand."